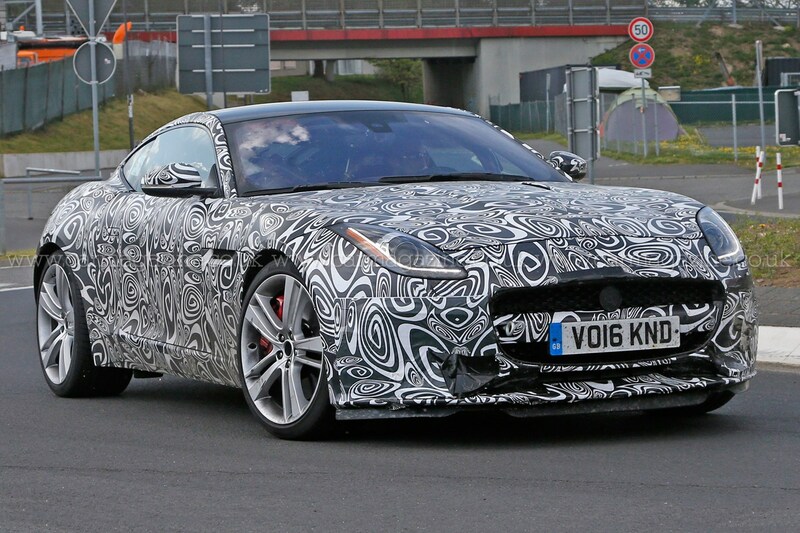 The long-rumoured four-cylinder Jaguar F-type appears to be on its way. Yes, these spy photos have revealed the next victim of downsizing – and it’s Jaguar’s muscular coupe. Our spy photographers captured this fairly conventional-looking F-type just outside the Nürburgring, and they’ve also seen it testing on the track. They reported, however, that it sounded different from any they’d heard before – while a quick registration check with the DVLA reported a displacement of 2.0-litres, indicating a four-cylinder engine. Fortunately, the check also revealed the fuel type was petrol, so there’s no shock diesel Jaguar F-type to worry about. Yet. Look more closely at the pictures and you’ll see some fairly key differences from the regular F-types, including a squared-off single-exit central exhaust and no retractable rear spoiler. It also looks like there are some subtle styling tweaks, including different bumpers, which would serve to visually differentiate the four-pot Jaguar from its brethren. So this will get the XE’s petrol engine, then? That appears to be the case so far, with our sources suggesting that the cut-price F-type will use the same turbocharged 2.0-litre four-cylinder petrol that’s currently found in the XE. In that application, it cranks out 237bhp and 251lb ft. As the newly turbocharged four-cylinder Porsche 718 Cayman packs 295bhp and 280lb ft, it’s likely that the F-type’s cylinder-shy engine will receive a few tweaks to bump up its output to competitive levels. However, the new four-cylinder F-type could well be the first production Jaguar to receive one of the new petrol Ingenium engines, which are due to arrive this year – and are likely to be available in more powerful forms right out of the box. After all, if you’re going to launch a new engine, why not do it with some style? Considering that this Jaguar is supposed to be a more affordable version, it’s likely it’ll get a six-speed manual as standard, too, while the eight-speed automatic could be offered as an option. An entry-level F-type with a four-cylinder petrol engine was suggested a few years ago, in order to make the sports car more accessible. Given the increasing prevalence and performance offered by comparatively affordable four-cylinders coupes, like the recent Porsche 718 Cayman, it’s likely that Jaguar now feels the need to extend the F-type range. No four-cylinder F-type convertible has been spotted yet, but it’s surely only a matter of time. Launching a more accessible model may also prompt a resurgence in interest in the F-type line-up, which has been overshadowed following the launch of the XE and F-Pace. Why change to a smaller, less exotic engine? It’s all down to the numbers. Currently, the least expensive F-type is the 3.0-litre supercharged V6 manual, which costs £51,775. It does 0-60mph in 5.5sec, tops out at 161mph and is claimed to average 28.8mph. CO2 emissions? A relatively heady 234g/km. Porsche’s flat-four 718 Cayman, however, offers up a far more appealing set of vital statistics. A standard Cayman will set you back a lesser £39,878, get from 0-62mph in 5.1sec, top out at 170mph and average 38.2mpg. The Porsche emits just 168g/km of CO2, too, entailing annual VED of £220.50 – which compares favourably to the V6 Jaguar’s £525. Admittedly that’s unlike to faze buyers of £40k sports coupes, but when they’re several years old and a fraction of the price it’ll become a more prominent factor. A smaller, lighter engine would also help bring the Jaguar’s kerb weight down from the V6’s quoted 1567kg. Besides improving its performance across the board, this would further help bring it in line with the 1410kg Cayman.